Are you looking for a good host for your online poker, casino, sweepstakes, sports-betting or other gambling content? You will need to find a host that is reliable, that is in a country that allows gambling, and that will keep your website online no matter what. 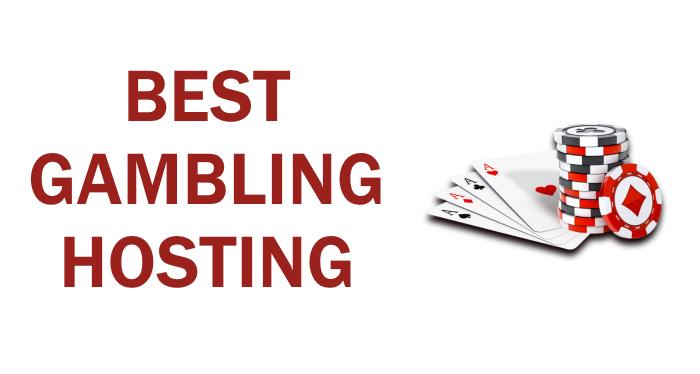 We found and reviewed top 10 hosts where you can host your gambling website safely. Getting into the gambling niche can be not only fun but also rather lucrative. Unfortunately, there’s a catch. It can be tough to find good hosting for your website, one that is safe and fast, and that will not ban your account. HostGator, BlueHost, and GoDaddy are known for shutting down gambling websites, and if you don’t want that to happen to you, check out alternative options. What you need to pay attention to when it comes to gambling hosting providers? When you’re trying to choose the best host for your gambling niche website, you have to read their terms and conditions, as well as the acceptable use policy carefully. If you don’t find anything that prohibits your content in there, contact their chat support or sales department to double check. Don’t launch your site with a hosting provider you’re not certain allows your type of website. Where is online gambling allowed? This is actually a pretty short list – most countries frown upon gambling of any kind. Some even don’t allow gambling affiliate websites. So, it’s important to choose hosting in a country that has a positive or a neutral legal regulation when it comes to gambling and gambling hosting. You can take hosting in the UK, Australia, New Zealand, South Korea, some provinces in Canada, certain states inside of the US (California, Illinois, New York, Pennsylvania, Massachusetts, Washington, Delaware, Nevada, New Jersey), several nations in and around the Caribbean Sea, and most European countries. Where is online gambling prohibited? Almost every other country in the world. All the states of the US except those we mentioned above prohibit online gambling. China, Turkey, Japan, many of the countries following Muslim faith… The list goes on and on. If you want to be completely safe – host your website offshore in a country that allows online gambling and gambling affiliate websites. Delaware based, Fozzy is a hosting provider that expanded greatly in the past several years, and they have data centers all over the world which is great for gambling hosting. Their prices are transparent, their offer is basic but good, and their plans are slightly customizable. This might mean a lot if you find yourself in need of some extra disk space or an additional database. Their shared hosting plans start at 3 euro per month, and they come with 10 GB of web space, 1TB bandwidth, integrated cPanel, and an unlimited number of sites. 2.VPS hosting plans are your other options on Fozzy, and you can choose between Linux and Windows OS. The highest Linux plan is $125 per month, and it offers 8GB RAM, 320GB of disk space, and 8 x 2.40GHz. The most expensive Windows plan is $180 per month, it comes with 200GB of disk space, 4×1.10GHz, and 8GB RAM. When it comes to Fozzy, they have several things going for them. Their prices are decent, all of their hosting packages come with SSD, they are using Litespeed Webservers that are a lot faster than Nginx and Apache, and users get free CDN. Those are some great upsides, especially for gambling hosting. When it comes to downsides, we have to be honest – Fozzy has some serious ones. They have no live support, all their plans have only the essential features, and their money back guarantee is only good for 7 days. Founded in 2005, this Russian hosting provider is not well known, but they are reliable. More important, they are great for gambling hosting. They offer high-quality casino web hosting, an extensive package of services included, and several data centers. Their security systems are advanced, which might be a great plus for your gambling website. They have more than 100.000 customers, which means they are a mid-sized company. Let’s Encrypt certificate comes free with the account, and they offer support for many software options. East 1 is their most basic plan and it costs $1.7 dollars per month. This plan comes with 3GB of disk space and unlimited bandwidth use. This is meant for small sites, but it can be upgraded if your website grows. When it comes to expensive plans, the most expensive thing we found on their website is a dedicated server. It costs $176 dollars per month, comes with 8GB RAM, 2x256GB SSD, and 1TB SATA. They also offer management and a Control Panel with this plan. SprintHost has some great pluses – WordPress, Joomla, and Drupal support, a good knowledge base, and a great customer support. They have a simple user interface that anyone can easily use, and a 15 day test period. On the other hand, they don’t have many payment methods, so that might be a hurdle if you want their services. eUKHost is based in the UK, and it was founded in 2001. They boast that their services come with no hidden charges and that their support team is always available. They are hosting over 150.000 domains and they have more than 35.000 customers. When it comes to safety, thy offer WHOIS privacy, security bundles, and a malware scanner. Their services are easy to use, and they are known for being extremely reliable. All of this makes them a good choice for gambling hosting. Basic cPanel hosting costs 3.33 pounds per month, includes 2GB of disk space, unmetered bandwidth, 10 MySQL databases, a free domain name, daily backups, and free Softaculous. 2.Their most expensive plan is the eUK E5 Enterprise ST dedicated server, and it costs 539.99 pounds per month. This offer includes 2 Intel Xeon E5, 16 cores, 64GB RAM, 8TB SSD, 1Gbit port speed, 50TB bandwidth, full management, and 2IPv4 addresses. eUKHost plans come with a 30-day money back guarantee, and you can even claim a partial refund for the time that’s left unused in your contract in case you decide to transfer before it expires. They offer cPanel, WordPress and PHP support, as well as a great, 100% uptime guarantee. On the other hand, their shared servers have had some glitches in the past. Also, your site might be a bit slower if you’re not in the UK, and their service activation can take too long. This American hosting company was founded in 2011 by 5 men who wanted to create a developer-oriented hosting company. Their fast success is proof that they managed to achieve just that. Digital Ocean platform is accessible and simple, which is why they have over 550.000 developers at the moment. Their prices range so that you can find exactly what you need. They have 12 data centers all over the world. So, you don’t have to worry about your clients experiencing any delay that might spoil their gambling experience. Their hosting plans are called Droplets, and they can be standard, optimized, and flexible. Standard Droplets plan 1 costs $5 per month, it has a single core, 1GB RAM memory, 25GB of SSD disk space, and it comes with 1TB for transfer. As basic offers go, this one is pretty good. Standard Droplets plan 11 costs $960 per month, it comes with 32 vCPUs, 192GB of RAM memory, 3.840GB of SSD space, and 12 TB for transfer. DigitalOcean plans all include global image transfer, a simple control panel, DNS management, and the option of private networking. On the downside, they don’t offer shared or dedicated hosting, and they don’t have managed hosting plans at all. That’s the price of being developer oriented. So, if you need something simple, but you are not an absolute beginner, you should consider this hosting. On the other hand, if you don’t want to worry about technical details, you should take one of the other entries from this list into consideration for your gambling website. One of the oldest hosting companies out there, DreamHost has over 400.000 active customers, and they are hosting more than 1.5 million websites. Ever since a few undergrad students from California founded it in 1996, this host has been growing. They accept a wide array of contents, including gambling (that is, as long as you’re not breaking any laws). Their platform is simple to use, their uptime is excellent, and they offer every type of hosting – shared, VPS, and dedicated. They believe in a one-size-fits-all policy, so you only have one offer for each, while prices differ depending on your renewal period – monthly is the most expensive while taking their hosting for 3 years will cost least. Shared – If you choose to take their shared plan for a month, it will cost you $10.95. It comes with a free SSL certificate, PHP 7.1 support, their control panel, IPv^ support, as well as Rails, Python and Perl support. They have no limitations when it comes to bandwidth, storage, the number of domains hosted, or emails used. Dedicated – Their dedicated servers are fully managed, and their most expensive plan is $279 per month. It has 12 cores and 16GB RAM. They offer DDoS protection, unlimited bandwidth, storage, MySQL databases, and 24/7 tech support and server monitoring. DreamHost has some serious upsides – they offer a 97-day money back guarantee, and they claim their uptime is 100% – if not, they will refund. Page load time is about 21% faster than their competition offers, bandwidth is unlimited, and their customer support is amazing. They do have downsides though – they are on the pricier side of the hosting spectrum, and they don’t offer cPanel, but their own version and their setup is delayed while they verify your account. A huge minus in our book is the fact that although their prices are transparent, the specs of their plans aren’t. They do not disclose RAM or CPU limits of their plans. So, if you’re a newbie, their user-friendly simple interface will be more than good enough, but if you want to know what you’re dealing with, move on. This hosting provider was founded in 2004 by a few friends who met at a university. Steadily, their web hosting service became one of the best in the niche. In the beginning, they only had a handful of people who worked from their university dorm rooms, but now they have over 400 employees, and they are still growing. They offer web hosting, cloud hosting, and enterprise hosting while focusing on latest technologies. When it comes to their prices, they vary greatly depending on your needs. SiteGround works perfectly with WordPress, they provide free Let’s encrypt SSL, and one-click Cloudflare setup. Thanks to the fact that they have servers around the world, your visitors won’t have speed issues on your gambling niche website. StartUp – This plan is an SSD-based shared hosting one, which means that your website will be on a shared server. It is the cheapest plan this host offers, and it costs 3.95 euro per month. With this plan you get 10GB of web space, it is suitable for approximately 10.000 visits per month, and you can host one website. Custom-made enterprise hosting – When you decide to take one of their custom plans, you get a ton of options. They offer full management, custom development workflow, and a reliable architecture. You will have a personal account manager who you can contact via Skype. Phone, e-mail or Slack. Full optimization also comes with higher prices, so you can expect prices over 190 euro per month (which is their most expensive standard cloud hosting plan). Unfortunately, we don’t have precise prices, as you have to contact them with your desired specs in order to get a quote. SiteGround definitely offers a pile of different options and a lot of customization. Unfortunately, their basic plans aren’t all that much, especially when you take price into consideration. But, if you need a host that offers a free transfer and setup, as well as a 30-day money back guarantee, it might be the provider you want. ISPserver is a reliable company that has been around since 1997. They are based in Russia, but their website has an English option as well. Their uptime is great, they offer a wide array of features that will fit any gambling niche website. Casino web hosting isn’t restricted by any traffic limits, they offer unlimited memory, and they have a multi-level security system. In addition to very good shared, VPS, and dedicated hosting plans, they offer colocation services, DDOS protection, SSL certificates, DNS hosting and a lot more. Their first shared plan costs 2 euro per month, it comes either with an ISP manager or a cPanel, it includes 5 databases, 10GB of disk space, and one domain. Free DDOS protection is included, as well as management. It’s for websites that do not exceed 1000 visitors per month. 2.When it comes to their dedicated servers, you can choose pre-built ones that are located in their German datacenter, or make a custom configuration that will be in their data center in Russia. A custom dedicated with all the best specifications can cost as much as 1479 euro per month, while a pre-made dedicated can cost you 415 euro per month at the most. ISPserver is really an all-around hosting provider that has a bit of everything. Their prices are great, their offers are more than decent, and their tech support is ok. On the other hand, they don’t offer many self-help options, they are focused on the Russian market, and their basic hosting plans are a bit pricier. Slotegrator is famous as a gambling software provider, but they also offer reliable high-speed online casino hosting. Their hosting is adapted for online gambling, so you know that it is customized for that purpose. They provide excellent security, they are an anti-abuse casino hosting provider. Round-the-clock service, stable servers, high bandwidth and completely customized plans sound great. When it comes to Slotegrator, everything is customizable. You can ask for the speed you need, CPU you want, RAM, disc space – literally whatever you want, and they will send you their offer. They offer uninterrupted website operation even under critical loads, and their customer support is really top notch. On the other hand, we don’t like that it is impossible to see their prices without contacting them and asking. They have no pre-made configurations for beginners, so if you’re not a pro, or you don’t have a developer, this is really not the hosting for you. When it comes to offshore web hosting, CCIHosting has been on the market for a while. Established in 2002, they have been providing a stable, reliable service ever since. This Panama based hosting company offers a lot of different services, and high-quality. What is most important for your website – they guarantee a high uptime, and they allow gambling niche websites. They have shared, VPS and dedicated plans, but they also offer anonymous hosting, offshore colocation, and domain privacy. Anonymous offshore hosting plans start at $6 per month. You can choose between cPanel and Plesk, and you get 512 MHz CPU, 512MB RAM, 15GB disk space, DDoS protection, nightly backups, Softaculous, and support for all PHP versions. Their most expensive plans are their dedicated ones, and the most expensive among those is their Windows OS E5-2609v4, that costs $525 per month, and comes with an 8 core CPU, 32GB RAM, 1TB storage, unmetered bandwidth, and DDOS protection. CCIHosting has a good price/quality ratio, they offer paying via bitcoin, they are reliable, fast, and their specs are great. They offer both Linux and Windows OS options. On the other hand, their customer support is a bit slower than the competition’s. And, yes, bear in mind that you can host your gambling website on their servers as long as final users are outside of the jurisdiction of Panama. Founded in 2012, this offshore hosting company is based in the Netherlands. They are one of the youngest companies on our list, but they are also one of the most reliable. Their offer is completely transparent, and they allow gambling content. They offer shared, VPS and dedicated servers, so anyone can find what they’re looking for here. Their shared plans come with limited bandwidth, while VPS and dedicated servers have unmetered traffic. A great thing about them is the fact that they don’t just offer hosting services, but also DDOS protection, free SSL certificates, free migration for yearly purchases, domain registration and transfer, server management, colocation, backup service, and even website development. SSD KVM Pro v32 is their most expensive plan, and it’s a VPS. It costs 229.99 euro per month, and it comes with an Intel Xeon E5 with 10 cores, 480GB SSD, 32GB RAM, unmetered traffic, and a 1Gbit port. With a 99.99% average network uptime, excellent customer support, amazing prices, and great plan specifications, it is completely understandable why AbeloHost is number 1 on our list. The only minus here is the fact that they limit bandwidth on their shared plans. But, in spite of that minor flaw, this provider really has all your gambling website might need, and they offer a 30-day money back guarantee.